Dar Lighting Axton small oval wall fitting displays a curved, ceramic washer which emit an attractive and inviting ray of light with up and down illumination. 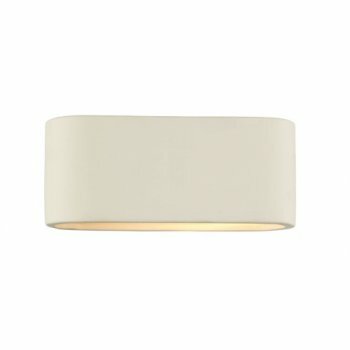 The product code for this Dar lighting wall fitting is AXT072. All our ceramic wall washers come with a white finish, however due to the nature of the material, the ceramic may be painted to match the design of any decor. This wall washer can be a perfect fitting for hallways, bedrooms and other living areas to provide warming light to the space. If you are looking for a similar style or shape we also stock range of ceramic wall washers from Endon Lighting, Franklite and Astro Lighting, all of which can be found by searching "ceramic wall washer" in the search box.